Page introduction. Notice the font size is a little larger than the rest on the text content on the page. Try to keep this a true introduction. A Short & sweet message is the MO for this area. Please no longer than three lines, otherwise it is overwhelming to read. ODC NOTE. 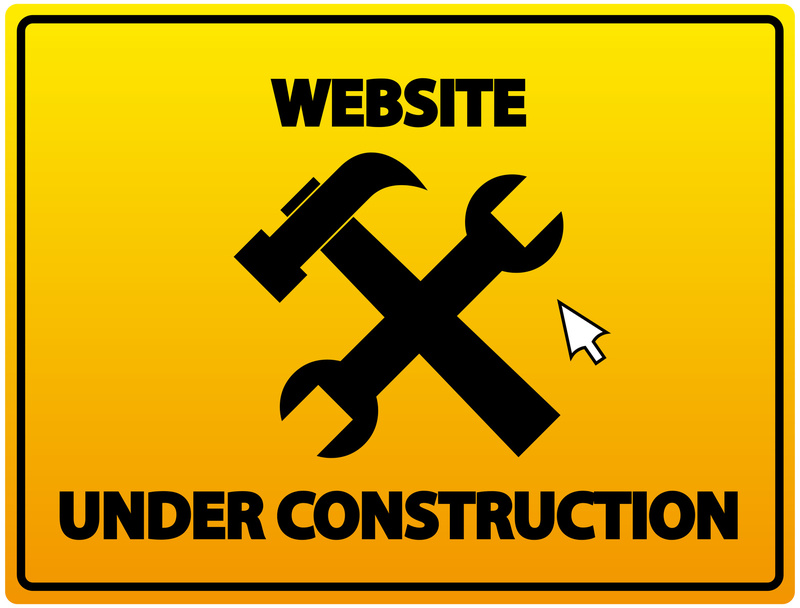 This section is strictly about the developers. Their claims for the project and what they actually have delivered elsewhere. Negative press or public reviews are welcome. NRDC - use statistics. # of developments in NJ, # with discount stores, # that include a Walmart - all to establish the types of retailers they have relationships with. 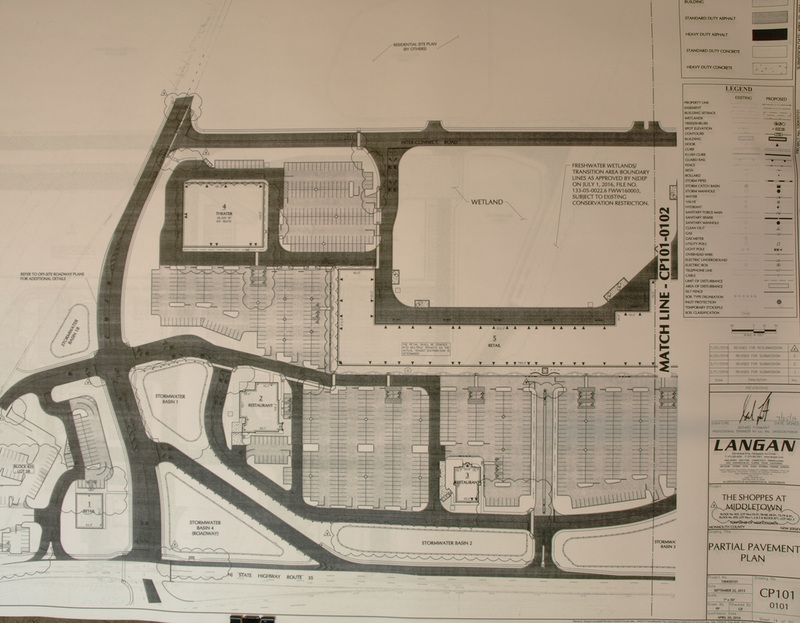 The National Realty & Development Corp. (NRDC) is the developer for "The Shoppes at Middletown" project. 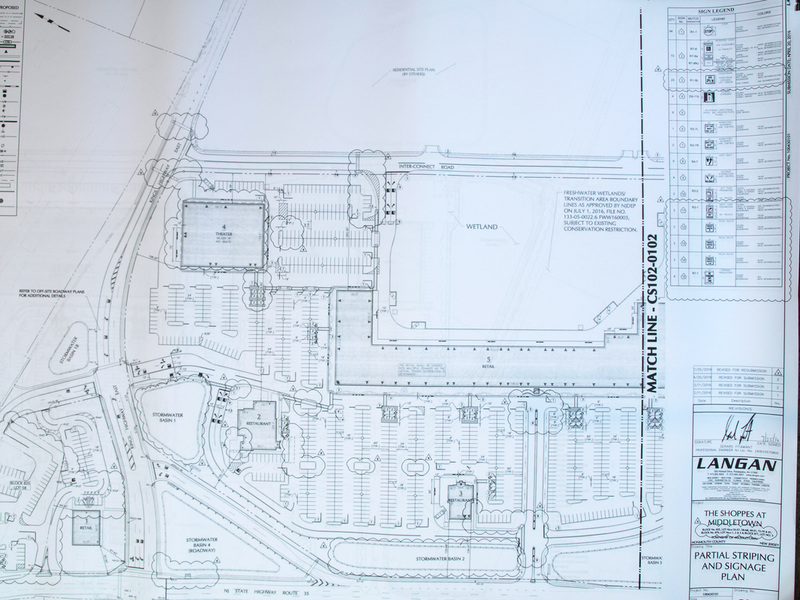 Their website claims, "The Shoppes at Middletown will be a premier 340,000 square-foot town center featuring ... upscale national retailers... exquisitely landscaped pedestrian areas, ... inviting ambient lighting, and relaxing outdoor seating areas." The slideshows, below, will give you the pictures and you pick the words. NRDC has 24 properties in NJ. 8 are office complexes or single stores, but 16 of them are strip malls and 56 % of those have a Walmart . Walmarts can stay open for 24 hours. In all of NRDC strip malls, 100% of the stores are mass merchant off price stores: TJ Maxx, Pet supply stores, Steinmart, Kohls, Dollar Zone, Marshalls, Party City/ Sams Club, Payless, Dry cleaners, Pet Value, Great Clips, GNC, Radio Shack, Nail salons. The restaurants located in all of the 16 NJ strip malls are: Villa Pizza, Arby’s, Dunkin Donuts, Burger King, White Castle, Jersey Mikes, Franks Trattoria (chain), Popeyes, TGI Fridays, Applebees, Ruby Tuesday, Pizza Hut and 1- Panera Bread. NRDC is proposing 5 restaurants with outdoor seating. (See the list of restaurants above that they currently have in their strip malls.) The tenants they have secured for The Shoppes at Middletown are: Pet supplies Plus, Spirits Unlimited, a grocery store, and a Cinemex movie theatre. All along Route 35 we have the very same discount stores that NRDC specializes in all their malls. The redundant retail stores that this developer will attract if allowed to build here will only will put the current discount malls we have out of business. 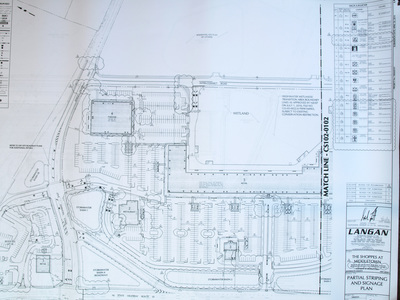 Toll Brothers, the developer of Bamm Hollow Estates in Lincroft, is also the proposed developer of The Oaks at Middletown, the residential component of Village 35. Unlike the Bamm Hollow development, which will consist of 190 homes on lots of up to 2 acres, The Oaks has a very different, more congested design.As currently planned, it will consist of 280 single family homes on a total of 62.5 acres and 3 multi-story buildings with 70 affordable housing units on 4 acres. With so much housing planned on so in so little space, there are environmental concerns, and the Toll Brothers record in that area should be looked at. Example two is when the company designed a plan for the Cottages at College State, PA, consisting of two 3-story buildings near Penn State University to be used as student housing. The community opposed this development based on proximity to water supply and fear of contamination by construction runoff and storm water. See the article "Chasing Ground" in the New York Times, 10/16/05, and read that Toll routinely uses the Mount Laurel Law as leverage in its negotiations with municipalities and also of the CEO's estimate that 90% of its NJ projects (at that time) involved "legal entanglements". 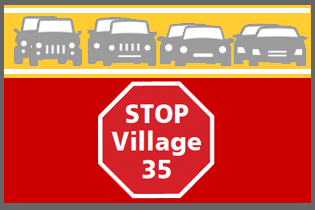 Please support Stop Village 35 with your contribution to enable us to continue in this fight. Here is the Toll Bros. plan for the densely packed 350 town homes. Notice the lack of open space in and around the units. The only open space on this property is the drainage basins and wetlands.There is also so little buffer zone between this complex and the neighboring single family homes on carriage drive. This community has a small clubhouse and a tennis court but hardly any playgrounds. 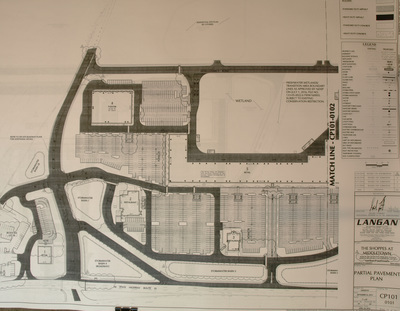 The town homes located near the area shown on this map as Phase 1-A are adjacent to the connector road and the back of the retail stores. They will smell the garbage and hear the delivery trucks all the time. Traffic from these 350 town homes will devastate this area with no new Route 35 /Tindall Rd jug handle revisions to the parkway and train station. Phasellus placerat ex sit amet diam semper imperdiet. Morbi dapibus mollis metus, id dapibus nisi lobortis et. Nunc dictum malesuada odio ac pretium. Phasellus volutpat sapien id sem euismod finibus eu ultrices tellus. Aliquam ullamcorper semper iaculis. Proin sit amet massa eget risus rhoncus pellentesque. Curabitur quis eros quis sapien semper ornare id ac mi. Proin volutpat vel arcu eu varius. Donec vel placerat sapien. Nullam efficitur lorem non accumsan lacinia.